Click the play button to view slideshow. 1.Preheat oven broiler on high. 2. In small saucepan over low heat, combine barbecue sauce and butter until melted and smooth. 3. 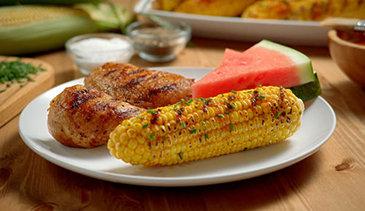 Place sweet corn in a medium-sized baking dish and pour barbecue mixture over sweet corn. 4. 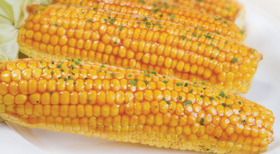 Broil sweet corn for 5-10 minutes, 4 inches from broiler, being sure to watch the whole time. 5. Turn and baste the sweet corn until golden. 1.Pat the chicken dry and season lightly with salt and pepper. 2. Preheat the grill to medium-high heat. 3. Spray the grill racks with the cooking spray. 4. Place the chicken on the grill and cook for about 20 minutes or until the internal temperature reaches 165 degrees. 5. Make sure chicken is completely cooked before serving. 6. Remove from grill and let stand for 2 minutes. 7. Serve with your favorite BBQ sauce. Heat oil in a large sauté pan over medium-high heat. Add the diced zucchini and squash and cook for two minutes or until it starts to become soft. Add the shrimp to the pan and continue to cook for another minute. Add cooked pasta and sauce to the shrimp mixture and stir to combine. Simmer for 5 minutes. Serve warm with grated cheese. 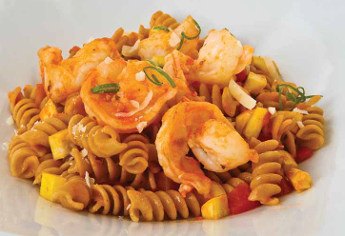 Chef’s Tip: This is a great recipe for using up leftover shrimp. Serve pasta with a garden salad and crusty bread. To assemble wraps, spread a light layer of mayonnaise over the surface of ¾ of each wrap. Add lettuce, carrot, and tomato evenly on each wrap. 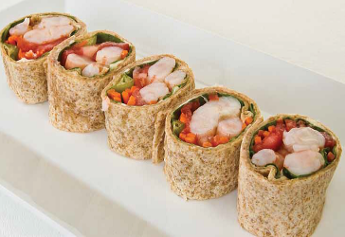 Top each wrap with cooked shrimp. Lightly season the wrap with seafood seasoning, salt and pepper and a squeeze of lemon juice. Firmly roll each wrap up. Slice rolls in half or into quarters. Serve with fresh Florida fruit salad. Chef’s Tip: Experiment with a variety of freshly cooked Florida seafood in this recipe. Pre-heat oven to broil. In a large oven-proof platter, place tortilla chips in a single layer. Sprinkle black beans on top of the chips. Sprinkle half of the shredded cheese evenly on top of the tortilla chips. Evenly distribute the shrimp on top. Add the diced tomato as the next layer. Sprinkle the remaining cheese over the top of everything else. Place the platter of nachos in the oven, and watch it carefully. Cook under broiler for 2 minutes or until cheese is melted. Remove from oven and let cool slightly. Garnish nachos with sliced scallions. Chef’s Tip: This is a great recipe to use with leftover shrimp. Picked Florida crabmeat is a great addition to this recipe. 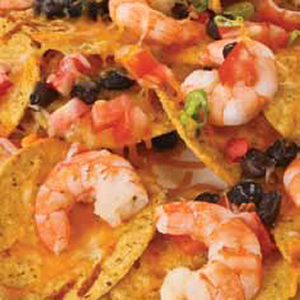 Serve nachos with low-fat sour cream and fresh Florida tomato salsa. Preheat a large sauté pan over medium-high heat. Lightly dredge shrimp in the flour and shake off excess. Add 1 tablespoon of oil to hot pan. Add the floured shrimp to the pan and cook for about 3 minutes until lightly golden brown. Add orange juice and honey. Continue to cook shrimp until the juice and honey have formed a glaze. Remove from pan and serve warm. 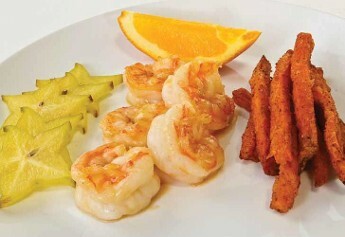 Chef’s tip: Serve shrimp with sweet potato fries and fresh fruit. Preheat a medium-sized sauté pan over medium-high heat. Add oil to hot pan. Lightly season fish fillets on both sides with salt and pepper and carefully add to the sauté pan. Cook fish 3 minutes on both sides until golden brown and completely cooked throughout. Make sure to test the doneness of the fillets by inserting a kitchen thermometer into the thickest part of the fish and obtaining a reading of 145 degrees or higher. Remove fish from pan and let the fillets rest while you assemble the other ingredients. 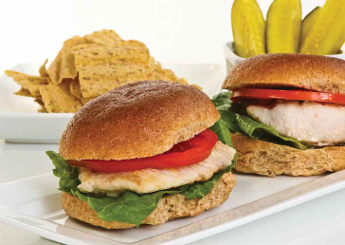 To make a fish burger, place fish on the bottom bun and add lettuce, tomato, your favorite condiments and the top bun. Chef’s Tip: Use any topping you like – cheese, onion, cucumber, etc. Serve with pickles and whole wheat chips. Preheat oven to 400°. Pour flour and panko breadcrumbs into separate bowls. In a third bowl, mix the egg and milk together. Lightly dredge the bottom of each fish strip in flour and shake off excess. Next, take the floured fish strips and put them into the milk and egg mixture. Make sure all sides are coated with the egg mixture. Finally, put the egg-mixture-coated fish strips into the panko breadcrumbs. Use your hand to help coat the fish strips with the panko breadcrumbs. Continue this process until all the fish strips are breaded. Spray a cookie sheet lightly with cooking spray. Arrange the breaded fish strips on the cookie sheet 1 inch apart. Lightly spray the top of the breaded fish strips. Place cookie sheet in the preheated oven. 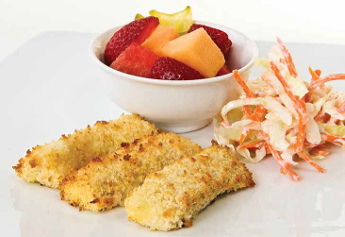 Cooking time of the breaded fish strips will vary depending on size, but should only take about 7 to 10 minutes to cook. To test the doneness of the fish strips: cut one in half - it should flake easily - or insert a kitchen thermometer into the thickest part of the fish and obtain a reading of 145° or higher. 1. In a medium-sized mixing bowl, combine mascarpone cheese, powdered sugar, vanilla and lemon zest. 2. Stir ingredients to combine. 3. Use a small melon baller or paring knife to hollow out the insides of the strawberries. 4. 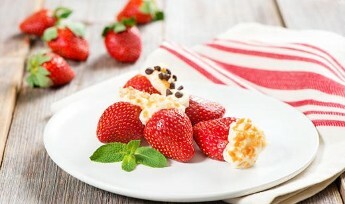 Use a small spoon to fill the hollowed-out strawberries with the mascarpone mixture. 5. Top the filled strawberries with assorted toppings. 6. Garnish with fresh mint leaves and serve cold. 1. 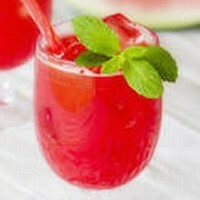 Add watermelon, honey and lemon juice to a blender and process until smooth. 2. Strain puree through a fine sieve. 3. Fill 4 glasses with ice. 4. 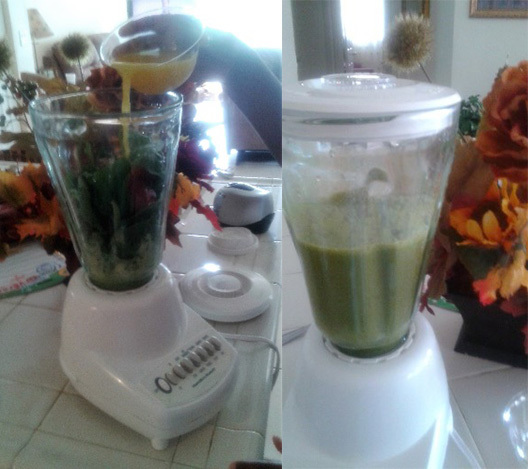 Evenly distribute the strained juice into each glass. 5. Top each glass with sparkling water and stir once. 6. Garnish with fresh mint sprigs. 1. 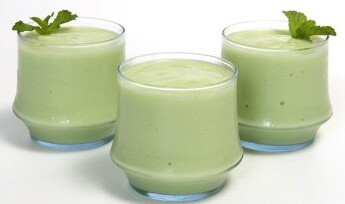 Place avocado and milk in blender (make sure lid is on tight). 3. Add frozen yogurt and ice cubes and continue to blend until smooth and creamy. 5. Pour any leftovers into an ice cube tray and freeze for later use. 1. In a small mixing bowl, combine blueberry jam and water. 2. Use a whisk to completely mix the jam and water together. 3. 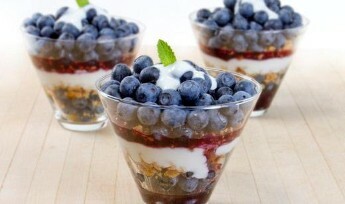 In four parfait glasses, make layers using granola, yogurt and fresh blueberries. 4. Evenly add one layer of the blueberry jam mixture. 5. Top each parfait with fresh blueberries and garnish with mint. 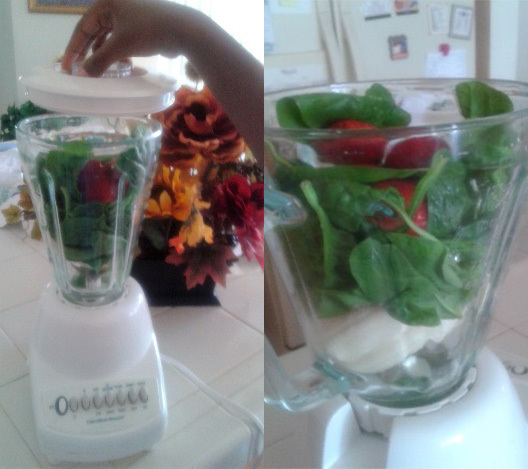 I made this healthy drink (given to me) with my seven-year-old. He really loved the taste. This is a great way to get them to eat veggies! Submitted by GBulluck.